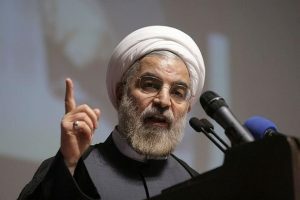 President Hassan Rouhani warned Tuesday Iran would quit the 2015 nuclear deal if Washington imposes new sanctions despite compliance with the historical deal. “If America wants to go back to the experience (of imposing sanctions), Iran would certainly return in a short time – not a week or a month but within hours – to conditions more advanced than before the start of negotiations,” Rouhani told a session of parliament broadcast live on state television. The re-elected Iranian leader has been under fire at home for signing a deal, which did not yield any fruit. The 2015 deal, known as Joint Comprehensive Plan of Action (JCPOA), with the United States, Russia, China and three European powers prevents the Islamic Republic from advancing its nuclear program and ensures gradual lift of economic sanctions. US President Donal Trump has rejected the deal, saying it does not completely curb Iran’s influence in the region. Early August, he endorsed a law by Congress to press new sanctions against Iran for its ballistic missile program and poor human rights record, despite the State Department’s judgement that Iran has complied with the terms of the nuclear agreement. The US treasury in July imposed sanctions against 18 people and entities for their support for missile program. The department also accused the targeted individuals of the theft of US and Western software programs and selling them to Iran. In response to Rouhani, US envoy to the UN, Nikki Haley argued that the sanctions were unrelated to the Iran nuclear deal and that Iran must be held responsible for “its missile launches, support for terrorism, disregard for human rights, and violations of UN Security Council resolutions”, report say. “Iran cannot be allowed to use the nuclear deal to hold the world hostage … The nuclear deal must not become ‘too big to fail’,” Haley said in a statement. The US official is to travel to Vienna next week to discuss Iran’s nuclear activities with UN atomic watchdog officials as part of Washington’s review of Tehran’s compliance with the 2015 nuclear deal, Middle East Monitor (MEMO) reports. Early this month, Ali Larijani, speaker of the Iranian parliament indicated that Iran turned to the JCPOA supervisory body, which qualified the US action as a breach of the agreement. Posted by KanelkaTagba on Aug 16 2017. Filed under Gulf News, Headlines. You can follow any responses to this entry through the RSS 2.0. Both comments and pings are currently closed.